Successful modern businesses are leveraging data from all sorts of sources, including people, devices and apps. How well has your business prepared for this? An agile analytics platform can help you get there. Using AI and IoT, a modern platform can enable you to deploy and retrain machine models on the fly while also performing real-time across the network, application and infrastructure layers. 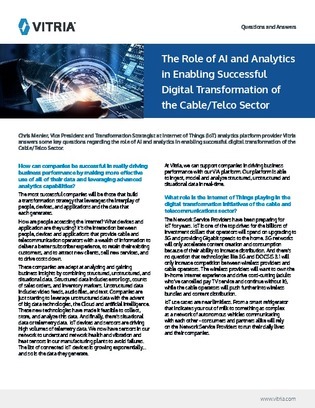 Download this Q&A with Vitria VP Chris Menier to learn about AI and IoT use cases in the cable and telecom sector, as well as how these technologies will continue to shape digital transformation.